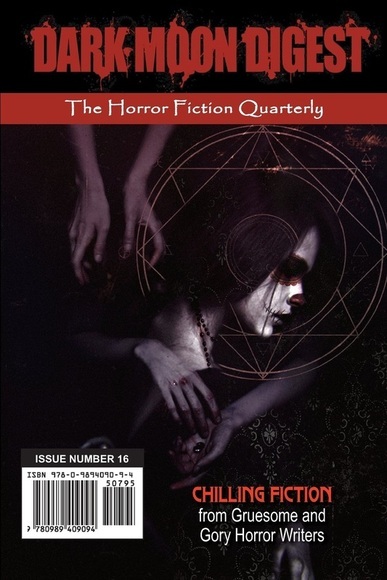 Kerry Alan Denney is the author of “October’s Children” in Dark Moon Digest 16. 1. Where do you generally find inspiration and what prompted the story you wrote for Dark Moon Digest? Inspiration comes to me from all directions, including parallel dimensions and dreams, often assaulting my mind like parasitic spirits determined to impose the history of their otherworldly existence on the inhabitants of this plane in order to show us all that yes, there are more things in heaven and earth, Horatio, than are dreamt of in your philosophy. “October’s Children” was inspired by a brisk Autumn breeze in which I heard ethereal voices whispering to me, and by a dream in which, as a teenager, I encountered the diabolical ghosts of several notorious mass murderers and serial killers as they were when they were children. The unique thrill of trick-or-treating and the creepy infamous Lizzie Borden song also played a large role in prompting this creation. 2a. Who is your favorite modern author? Edgar Rice Burroughs, all the way, even if he is not yet considered “classical.” Tarzan, John Carter of Mars, Pellucidar, and Carson of Venus took me to astounding worlds I longed to explore further, and kick-started my vivid, overactive writer’s imagination. Kenneth Robeson, author of the Doc Savage and The Avenger stories, and Maxwell Grant, creator of The Shadow, are a very close second and third. 3. Are you ever afraid of your own creations? Absolutely! I creep myself out regularly, because my characters and their various worlds often seem to come from a place outside of my mind and existence as if implanted in my head through external sources such as spirits and inter-dimensional beings. My characters often take on a life of their own as I write them, as if they already exist in this world or a world just around the corner from this plane, and I am merely a scribe vicariously relating their adventures and experiences. Sometimes they wake me up in the dead of night to whisper their stories to me... and sometimes they invade my dreams. 4. Tell us something non-writing related about you. I have a seven-year-old Golden Retriever named Holly Jolly who is a trained professional Therapy Dog as well as a certified Canine Good Citizen. Holly is loving, gentle, affectionate, playful, and a furry bundle of endless fun. We participate in two local library-sponsored R.E.A.D. programs (Reading Education Assistance Dogs) called Doggie Tales and Read to Rover on three Saturdays a month. We go to the library, sit in the children’s section, and the kids pet the dogs, read to them, and show them picture books if they don’t know how to read yet. The program encourages reading and improving reading comprehension skills as well as helps children overcome their natural trepidation and fear of dogs, and teaches them how to properly approach and acquaint themselves with strange dogs. We also visit a local retirement/ assisted living home, and are constantly looking for other places and events in which her unique love is desperately needed. Holly is a big hit with the kids—young and old—like a furry rock star minus the rad shades and leather regalia! Make sure to pick up a copy of Dark Moon Digest 16 to read Kerry’s creepy tale!